Abstract: This thesis investigates the process of two-photon absorption in optical detectors. We begin by describing some concepts of nonlinear optics and considering two-photon absorption as a nonlinear effect. We next mention some applications of two-photon absorption in high-speed optical communication systems. We describe the complete experimental characterization of two-photon absorption in a silicon avalanche photodiode. 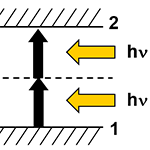 Two-photon absorption sensitivity factors and polarization dependence are investigated both theoretically and experimentally. Finally we compare the results of the measurements with those obtained from a similar detector.